We are glad of being able to offer you piece, at about 500 gr. 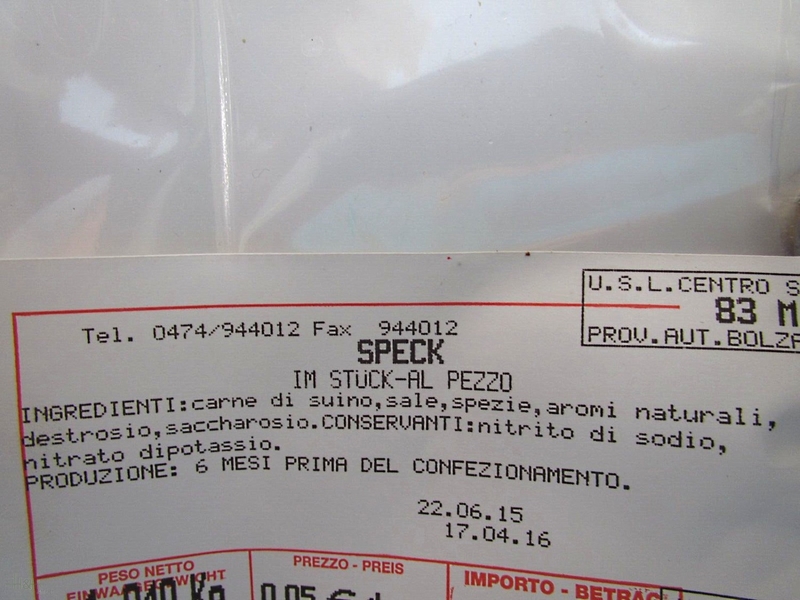 of authentic bacon of speck, produced by the butcher's shop Hell Monguelfo, in the wonderful place of Val Pusteria, according to the ancient manual traditions and when the transmitted prescriptions were following generation in generation. Attention and guarantee of hygiene in the preparation of the product are inalienable priorities next to the most rigid quality controls, so to ensure for yourselves in each moment the freshest speck with this spectacular taste. always, this is the strategy that guarantees the success of our company! A company rich in history and in traditions, more than 180 years of property of the same family, the butcher's shop Hell, one of the most ancient artisan enterprises of the South Tyrol produces and works, continously, the best swine meats. They are born so, ready to be sold, the speck, the sausages or any other type of meat of pork. In 2000, the Chamber of commerce, industry and handicraft of the province of Bolzano has recognised the high professionalism and the extraordinary performances of the family Hell conferring the Masters' honour of the Work on him. The speck has a maturation of at least five months and, to the moment of the sale, is put under gap, so to guarantee a long period of duration and an additional certainty during the transport and the delivery to Your house. Remember that even more the speck is seasoned, so much greater will be the aroma and the taste that they will reach in Your houses! Many people think that of speck exists a single type but, in fact, it is not like that. The mastery and the tradition in the working of different parts of the pork, placed side by side at a very favourable climate allow a diversified production. We offer you here two different typology of speck: that product using the stomach of the pork, characterised by a prevalence of whiter and soft part; or that one obtained working the back part of the animal, in whom there prevails the typical taste of the smoking of the meat, when there was burning wood of pine or of fir, and different typology of natural spices, used in the phase following to the process of salting, between whom there plucks the unmistakable taste of the juniper of our mountains. An important advice, at last, as far as it concerns the conservation and the consumption of our products - that being completely natural - need to breathe. Leave them then, after the opening of the manufacture, for a little bit of time, between two plates so that they could emit the whole aroma in a dry room or also in the refrigerator. ready for shipment: in stock Schüttelbrot Trenker 200 gr. "Tartufata" is excellent for hors d'oeuvres, rice and pasta dishes and filling for main courses. Bacon Speck cubes Grammhof Sarntal L. Moser approx. 150 gr. Tariquet Armagnac VSOP GB 40,00 % 0.5 l.
Some very nice tasty bacon. A soft and almost sweet taste. South Tyrolean Farm Bacon Bauernspeck Steiner approx. 500 gr. 19,80 EUR / 3,96 €/100 gr. Bacon Speck Bernardi Karl 1/8 heart-piece approx. 500 gr. 14,60 EUR / 29,20 €/kg. Bacon Pancetta Nocker pieces vac. appr. 250 gr. 5,00 EUR / 2,00 €/100 gr. Belly bacon smoked portioned vac. appr. 340 gr. 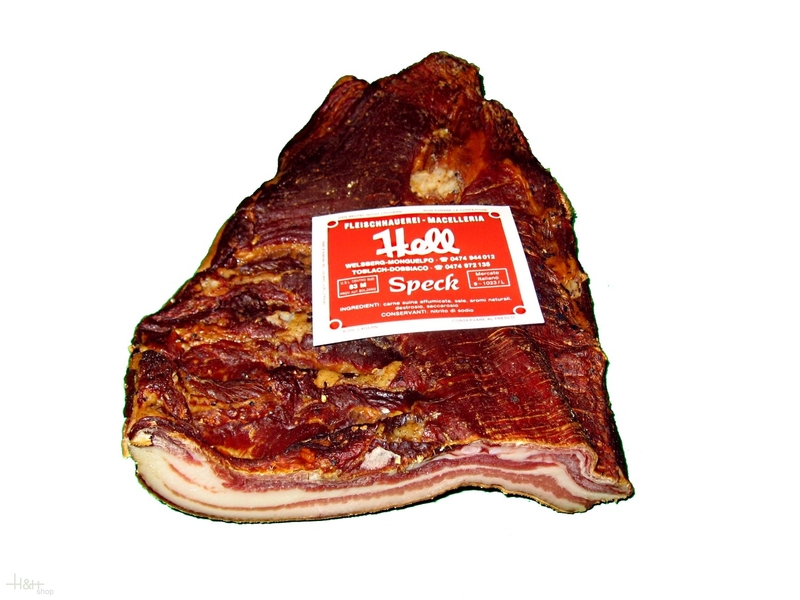 - Kofler Speck South Tyrol 8,25 EUR / 2,43 €/100 gr. Traditional Speck 1/2 flitch of bacon approx. 2 kg. - Butchery Hell 34,60 EUR / 17,30 €/kg. Some very nice tasty bacon. A soft and almost sweet taste. ..